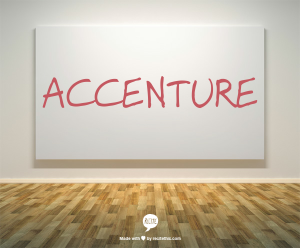 In this article, we will look at the consulting firm Accenture. This is one of the largest firms in the world, which often interests students seeking a career in consulting. First, review it on U.K. and corporate sites. Then, even if the video is a little out-dated, here is Accenture’s vision of life for its junior consultants. Should You Start Your Career at Accenture? It all depends on your professional project. If for example, you have a technical background, if you are passionate about process optimization methodologies, or you are an expert in operational excellence, then Accenture might be a great choice for you. In terms of choice of lifestyle, you should know that at Accenture, trips are pretty intensive. It is not uncommon to travel four or five days a week to work with your customer. In absolute terms, Accenture is a big name in consulting; it is a recognized brand, and in its field it is an institution of excellence. Note that the firm presented itself first as a management consulting company, followed by its expertise in technology services. But is that really the case? It should be noted that some recruiters consider that an early career at Accenture might be detrimental to an upcoming path in strategy consulting. Their rationale is as follows: if Accenture has many business units, the most widely recognized is clearly concerning the technology consulting. Thus, this path of career of excellence that characterizes the firm appears to be relatively remote from strategy consulting. For my part, I challenge this opinion. Indeed, the technology sector is extremely attractive for major consulting firms in strategy. In addition, they do not always have the technical consultants’ profiles to work on technological projects. Of course, each office of BCG or McKinsey in a mature consulting country has technical consultants, but the traditional recruitment channels in consulting are certainly not enough to source the number of consultants required with these specialties. In this context, having experience at Accenture could be a real asset for you. Moreover, at the Boston Consulting Group I saw the recruitment of several former consultants from Accenture. They have also been very successful at BCG. In all cases, a consensus exists to say that Accenture is an ideal place to start a career in consulting a bit late. To give a few orders of magnitude, let’s talk about the Accenture portfolio in the United States. Accenture serves over 92% of Fortune 100 companies and more than 75% of Fortune 500 companies. First of all, and it’s quite original in the landscape of consulting; Accenture headquarters is located in Ireland, in Dublin, more specifically. It is a company which has more than 289,000 consultants, distributed in 56 countries, with more than 200 offices. This company generates $30 billion in annual revenue.